A liberal think-tank says the Graham-Cassidy effort would also result in fewer insured Americans. WASHINGTON — Most states would take a stiff budgetary hit if the latest Senate Republican health care bill becomes law, according to an analysis released Wednesday. That would likely result in more uninsured Americans. The consulting firm Avalere Health found that the Graham-Cassidy bill would lead to an overall $215 billion cut to states in federal funding for health insurance through 2026. “A reduction in federal subsidies for health insurance is likely to result in more people being uninsured,” said Caroline Pearson, a senior vice president at Avalere, which specializes in health industry research. States that voted for President Trump would not be immune from cuts, though deep-blue California and New York face the deepest reductions. West Virginia, a Trump bastion, would see a $1 billion cut from 2020-2026. The Avalere analysis comes as Senate leaders are rushing a vote on the legislation by the end of the month. Named for Republican Sens. 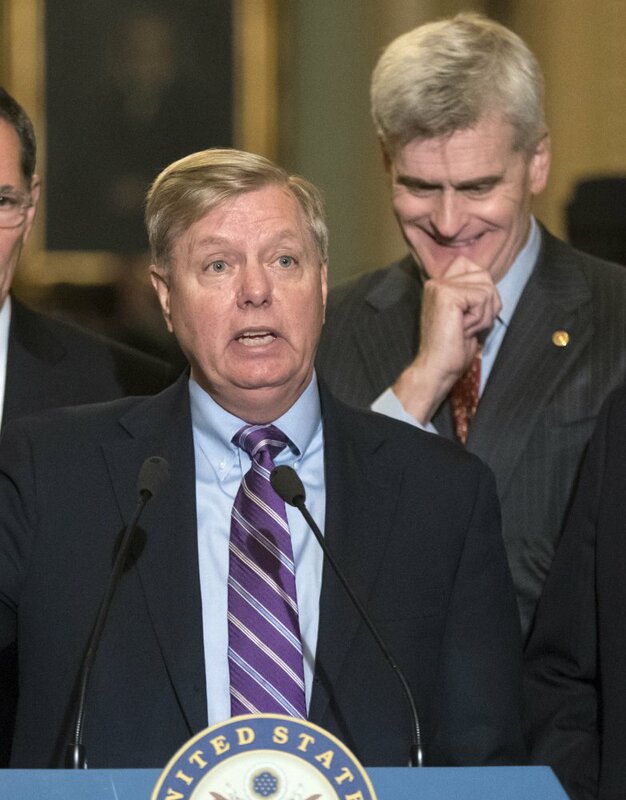 Lindsey Graham of South Carolina and Bill Cassidy of Louisiana, the bill would repeal much of the Obama-era Affordable Care Act and limit future federal funding for Medicaid. The bill would also end Obama’s health insurance subsidies and put money into a pot that would be distributed among states. Governors and legislatures would have leeway on how to spend the money, and could also seek waivers from ACA requirements. Though insurers would still have to cover people with medical problems, in some states they could charge more. Arizona and Alaska would be among the losers, a detail that could be important. Sens. John McCain, R-Ariz., and Lisa Murkowski, R-Alaska, are seen as undecided on the legislation, and Republican leaders cannot afford many defections. New Jersey Republican Gov. Chris Christie said he is opposed to the Graham-Cassidy bill because of cuts to his state, estimated by Avalere at $10 billion from 2020-2026. Texas would be the biggest winner, with a $35-billion increase by 2026. Georgia, Alabama, Tennessee and Virginia would also see funding gains, as would Wisconsin and Wyoming. Within states, the analysis found that there could be winners and losers among people at different income levels. Because the Republican bill focuses on covering the poor, states may decide to reduce support for middle-class people who now receive subsidies under Obama’s law. Funding for the Avalere report was provided by the Center for American Progress, a liberal think tank.